Here's a terrific Legion pinup by the Wildstorm crew on their Gelatometti blog. This was a gift to departing publisher Paul Levitz. 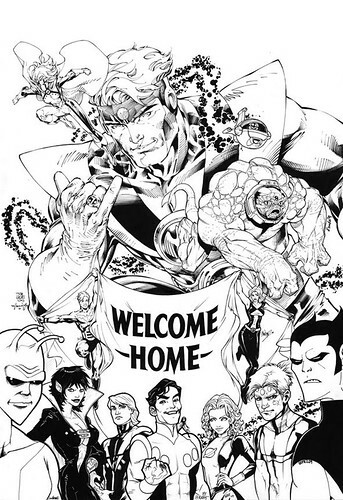 The sign says "Welcome Home" as he is returning to writing the Legion in Adventure Comics. This drawing brings back memories of the Levitz-Lightle Legion era, with Sensor Girl, Kismet, and Tellus featured prominently on top. A great way to celebrate Levitz returning to these characters! Nuff said.